I grew up as one of eight children in Cowes on the Isle of Wight – places on ‘the island’ feature strongly in Slave to Fortune. When I left high school, I headed north to Scotland and studied English Literature for two years at university before switching to graduate in economics to improve my prospects of finding a job – which seemed to work. I have since enjoyed a varied career in government, working with some of the biggest names in British and Scottish politics. My work has taken me across the Middle East and Africa, to China and Japan, Europe and the United States. I have worked on issues including crime and justice, housing, tackling poverty and inequality, economic policy and international finance. I currently work on reducing unemployment, raising skills and improving working conditions in Scotland. 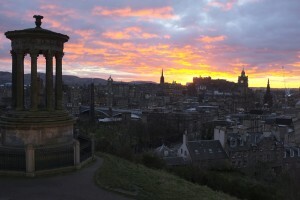 Edinburgh Sunset – taken by my dad. Outside of work, I live in Leith (Edinburgh) with my wife and three young children. My current interests, largely dictated by the kids, include: playing football with my sons; running with my daughter and hillwalking with the whole family. This leaves me with a little time late at night for reading and creative writing. DJ Munro on Arthur’s Seat, with Leith in the background – taken by my elder son. I have tried my hand at a number of genres. In addition to Slave to Fortune, I have written a political thriller (which I might seek to publish some day) and I’m currently working on a series of children’s picture books, which I hope to publish over the next year or two. I’d say that my novel writing has a traditional style, drawing influence from classic authors of the late 19th and early 20th centuries, including Scottish authors such as Robert Louis Stevenson and Neil Munro. However, I like to inject modern themes into my writing, to ensure relevance to readers today. I was honoured to win the Grand Prize for young adult fiction at the Chanticleer International Book Awards at Bellingham, WA (USA) in April 2018 and a further First Place award for historical fiction. Here’s an arty picture of me taken by my daughter in downtown Bellingham, with a suitably American backdrop (we don’t have streets like this in Scotland).